Q. 1 (a) Write the uses of scale. (b) A block of ice-berg 1000 m3 volume is represented by a block of 27 cm3 volume. 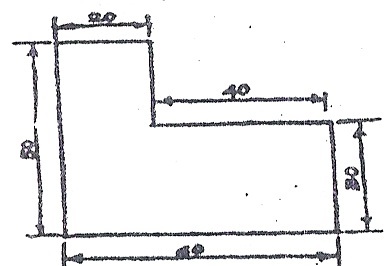 Find the construct a scale to measure upto 60 m. Mark a distance of 42.5 m on the scale. 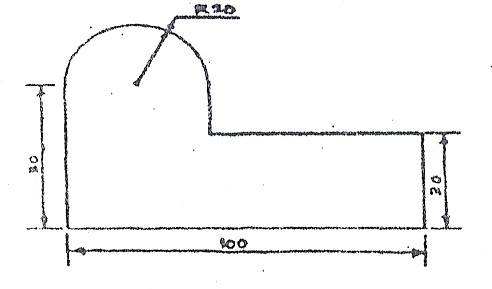 (c) A stone is thrown from a building of 7m height and at its highest flight, the stone just crosses a palm tree of 14m h e i g h t. Trace the path of the stone, if the distance between the building and the tree is 3.5 m.
(d) Draw a hypo-cycloid of a circle of 40 mm diameter, which rollsl inside, another circle of 160 mm diameter, for one revolutiorj counter clock-wise. Draw a tangent and a normal to it at a poi 65 mm from the centre of the directing circle. Q.2. (a) Why the projections of an object are not drawn in second and fourth quadrants ? (b) Point A, 7 mm above the HP and 15 mm infront of VP. Point 40 mm above the HP and 50 mm infront of VP. Projectors point A and B are 50 mm apart. Draw the projections of Line fiiS and find its HT, VT. Find the length of Line AB. (c) A line AB 70 mm long, has its end A at’.10 mm’above HP and 15! mm infront of VP. Its front view and top view measure 50 mm and 60 mm respectively. Draw the projections of th,e line andj determine its inclinations with HP and VP. (d) A room is 4.8 m x 4.2 m x 3.6 m high. Determine graphically the distance between a top corner and the bottom corner diagonally opposite to it. Q.3. (a) Define auxiliary plane and classify it. (b) The top view of a plate, the surface of which i§ perpendicular to the VP and inclined at 60° to the H.P. is a circle of 60 rrmi diameter. Find the true shape of the plate. (c) A cube of 25 mm edges, is resting on one of its faces on HP[ Itl is cut by a plane in such a way that the true section! available is a regular hexagon. Find the apparent and true section of the cube. Find the inclination of the sectional top view with HP and VP. (d) A pentagonal pyramid of base side 30 mm and height 50 mm! is resting on the ground on one of its base side in such a way that! one of its triangular face is perpendicular to both HP and VP. Draw the projections. Q.4. (a) What are the practical applications of development? (b) A hexagonal prism of side of base 30 mm and axis 75 mm long, is resting on its base on HP such that, a rectangular face is parallel to VP. It is cut by a sectional plane, perpendicular to VP and inclined at 30° to’HP. The section plane is passing through the top end of an extreme lateral edge of the prism. Draw the development of the lateral surface of the cut prism. (c) Draw the isometric drawing of the frustum of a right reg pyramid, side of base hexagon is.20 mm and of the top hexac is 1 0 mm and height of the frustum is 40 mm. 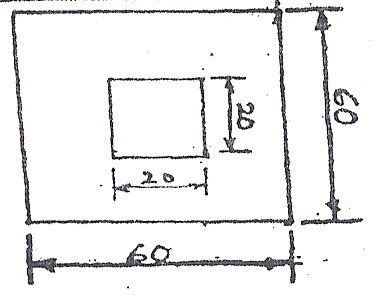 (d) Plan and elevation of an object are identical as showi’ figure, draw the isometric view. the name of any four display commands. (d) Write the steps to prepare the following drawing in AutoCAD.